Are you looking for flagging companies? Certified Construction Flaggers make all the difference in your work zone. A certified flagger will assist the traveling public as they approach and travel through your work zone by informing them as to when it’s safe to proceed, and when they need to stop. A four wheeled scraper can weigh as much as 200,000 pounds and travel up to 35 miles per hour. This is when you will want a certified flagger to stop traffic as these large machines cross paths with the traveling public. A flagger’s job is protecting the traveling public and highway workers form each other. 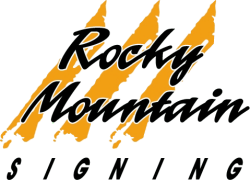 Rocky Mountain Signing is one of the top flagging companies in Colorado. We provide flagging service traffic control services to all of Colorado. A seasoned certified construction flagger is who you want on the back of a barricade truck as you set and pick-up a difficult lane closure on an interstate or highway. Setting the arrow board in the correct location, and making sure the traffic cones are in the correct tapper based on the speed limit is imperative, and a certified flagger will help you get this done. All individuals working in flagging service traffic control in the state of Colorado must pass the “Flaggers Test” before they can work on any roadway. Rocky Mountain Signing Company is a proctor for the State of Colorado and can administer, test and issue a certification to all flaggers passing the test. Rocky Mountain Signing Company sells all PPE (personal protective equipment) that a flagger will be required to have, including a safety green hard hat, class III safety vest, reflective pants for night all night work, steel toed work boots, safety glasses and gloves. Call Rocky Mountain Signing today, one of Colorado's best flagging companies with Colorado's best construction flaggers.